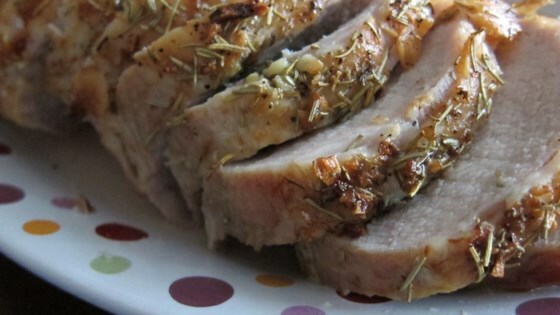 "Succulent pork roast with fragrant garlic, rosemary and wine." Crush garlic with rosemary, salt and pepper, making a paste. Pierce meat with a sharp knife in several places and press the garlic paste into the openings. Rub the meat with the remaining garlic mixture and olive oil. Place pork loin into oven, turning and basting with pan liquids. Cook until the pork is no longer pink in the center, about 1 hour. An instant-read thermometer inserted into the center should read 145 degrees F (63 degrees C). Remove roast to a platter. Heat the wine in the pan and stir to loosen browned bits of food on the bottom. Serve with pan juices. I thought that this was okay... The rosemary provided some flavor but I didn't feel that there was enough flavor to want to go back for seconds.